New Listing! It goes without saying that it is even more exciting to explore a new city if at the same time one feels at home. This home is quiet, simple and elegant in the heart of Rome, between "Piazza di Spagna" and "Fontana di Trevi", two steps from the metro of "Piazza Barberini". Living room with sofa bed and dining area, well equipped kitchen, bedroom with double bed and relaxing bathroom with bathtub. Wi-Fi, Air Conditioning, Microwave, Washing Machine and a well stocked grocery store near the apartment. 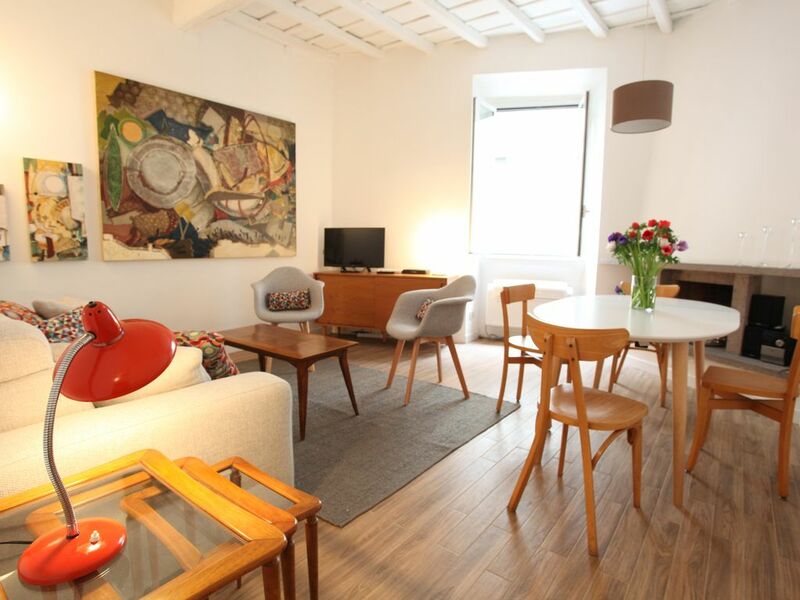 This delightful apartment is located on the second floor of a typical medieval dwelling in the heart of Rome. You will be just 5 minutes from the famous "Piazza di Spagna" and the majestic "Fontana di Trevi". The apartment is around 700 square feet and consists of a cozy living room with a comfortable sofa bed for two, dining area with a table for six people, a bed room for two with a build in closet and a window that faces the quiet inner courtyard. The kitchen is well equipped; it has four burners, microwave, kettle, toaster, washing machine. The bathroom is spacious with tub, ideal for a relaxing bath after a day of intense exploration of Rome's mysterious art and cultural treasures. The apartment has air conditioning and Wi-Fi. The window in the living room faces Via Dei due Macelli, where you can find the newest "Rinascente",one of Italy's most elegant, high-end department stores. In the same building we recommend to visit the down-stairs archeological site. Here you can view remnants of the "Aqueduct Vergine". The rooftop terrace hosts restaurants and bars, where you can enjoy a relaxing areal view of the many domes and tile-roofs of Rome. A few meters from your home on Via Crispy you will find a parking-lot for secure paid parking. Metro and grocery stores are also nearby. My name is Costanza. I was born in Rome. I live in Trastevere, one of Rome’s unique neighborhoods. I speak fluent German and English. I have always been interested and curious about other cultures and religions. I love art in all its manifestations. In my free time I enjoy the soothing beauty of nature in the Tuscan countryside. I have worked over 10 years in the vacation-rental business. There is no better place than doing this business in Rome. I love Rome not only because it is my native city but also because it has infinite mysteries to disclose. After all this years living here, I am still enthusiastically exploring Rome’s art, history, museums, food, neighborhoods etc. And I can’t wait to share all this with you. For just a short time this is your VACATION RENTAL, but remember you hold the key of someone’s cherished home. Show you care. Bring the garbage out & turn off the lights when you leave. If there’s something wrong make sure you call for help. Respect the Neighbors & house rules. Shop in local stores, speak to local people, cook local recipes. Be curious & flexible. Don’t compare your rental with your home, instead learn from how other people live. On your return remember to leave a review and praise all that you loved most. Your Vacation rental experience reflects you, so make it EXTRAORDINARY !! I will be at your disposal when you check-in at the apartment. At that time, I will provide you with all the information and instruction you need for your stay. I will also be available any time for suggestions about exploring the neighborhood and touring the city. Late check-in (after 9pm) extra fee di € 30 (to pay at check-in) Please do not smoke inside the apartment, it is prohibited. We are able to provide extra cleaning services, airport shuttle services, cribs for toddlers (30 Euro) or tour guides at a reasonable price. This apartment was perfect, had everything we needed for our stay in Rome. Great location, within walking distance to most of the major tourist attractions, except Vatican City. Costanza was awesome, met us on arrival and gave us lots of great information about the area. Would definitely recommend and stay here again. We had a wonderful week in Rome and this apartment was a great place to relax after sightseeing all day. It was great to have a nice kitchen and big bathroom. The bedroom was quiet despite the apartment's location in the middle of the action of the Spanish Steps area. It was wonderful to be near a grocery store, good restaurants and bars, and great shopping. Costanza gave wonderful recommendations and arranged us a ride to and from the airport which took lots of stress from us. thank you so much , it was realy nice meeting you . All the best . Close to everything! Bus, Metro, shopping, restaurants, markets. Costanza was very helpful with suggestions for sites to see & restaurants etc. Clean & kitchen fully equipped. Has everything you need for your stay in Rome. Excellent location, very comfortable, spacious space for me and my two daughters to come “home” to. Terrific place for a family with two kids. A beautiful, very comfortable place to come back to after logging a few kilometers of sightseeing. And the location could be better vis a vis proximity to virtually everything and the subway for anything further out. And Costanza was very conscientious about arranging for a seamless arrival. I can’t wait to go back to Rome and stay at Costanza’s! Brilliant apartment in the heart of Rome. Costanza was amazing and gave lots of great local hints for where to go and eat. Costanza also helped me considerably when I needed it and am very grateful for the assistance. Thanks will be back. Hi tina , thank you , it was nice meeting you, All the best ! The tickets for tram and buses are sold at newspaper stands or in the “Tabaccherie”. One advise while taking the public transportations: keep you valets and purses and personal belongings under constant watch (never behind your body)- there is plenty of pickpocketing! Rome can also be experienced by riding bikes or scooters that can be rented. If you decide to do so, be an attentive driver because Rome's traffic is quite challenging and unpredictable.